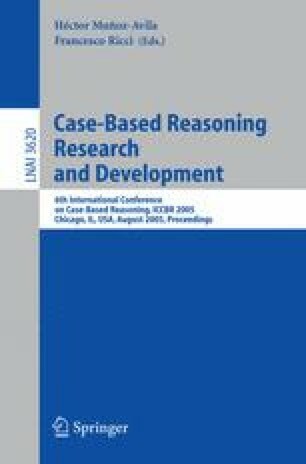 In this paper, we address the use of CBR in collaboration with numerical engineering models. This collaborative combination has a particular application in engineering domains where numerical models are used. We term this domain “Case Based Engineering” (CBE), and present the general architecture of a CBE system. We define and discuss the general characteristics of CBE and the special problems which arise. These are: the handling of engineering constraints of both continuous and nominal kind; interpolation over both continuous and nominal variables, and conformability for interpolation. In order to illustrate the utility of the method proposed, and to provide practical examples of the general theory, the paper describes a practical application of the CBE architecture, known as CBE-CONVEYOR, which has been implemented by the authors.Pneumatic conveying is an important transportation technology in the solid bulks conveying industry. One of the major industry concerns is the attrition of powders and granules during pneumatic conveying. To minimize the fraction of particles during pneumatic conveying, engineers want to know what design parameters they should use in building a conveyor system. To do this, engineers often run simulations in a repetitive manner to find appropriate input parameters. CBE-Conveyor is shown to speed up conventional methods for searching for solutions, and to solve problems directly that would otherwise require considerable intervention from the engineer.